Secretary of Homeland Security Kirstjen Nielsen has resigned from her post, President Donald Trump announced Sunday evening. Her departure is reportedly part of a massive overhaul at the department, led by White House adviser Stephen Miller. "Secretary of Homeland Security Kirstjen Nielsen will be leaving her position, and I would like to thank her for her service," Trump tweeted. "I am pleased to announce that Kevin McAleenan, the current U.S. Customs and Border Protection Commissioner, will become Acting Secretary for @DHSgov. I have confidence that Kevin will do a great job!" Nielsen, who replaced Retired Marine Gen. John Kelly as head of DHS when he was tapped to become the White House's chief of staff, became the youngest person to occupy the role at the age of 46. During her confirmation hearing, she faced intense criticism because she had no previous experience leading an organization the size of Homeland Security, the government's third-largest agency. Trump had a contentious relationship with Nielsen, at times blaming her for not being tough enough when it came to immigration enforcement and feeling frustrated that she didn't implement his hardline immigration policies with enough gusto. He repeatedly scolded her at Cabinet meetings, questioned her loyalty, and mockingly called her "Bushie" in reference to her experience working on President George W. Bush's administration. 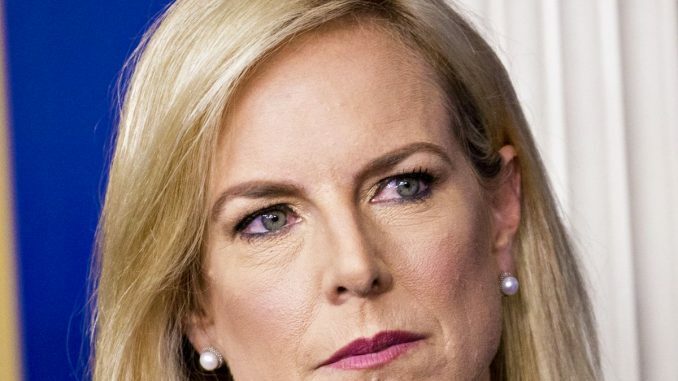 Nevertheless, Nielsen was a reliable foot-soldier of the White House and became the face of the administration's outrageous zero-tolerance immigration policy, which led to the forced separation of thousands of migrant families at the U.S.-Mexico border last year. Nielsen's false claims and cold defense of the policy led to calls for her firing. She was even heckled out of a Mexican restaurant for her role in the border crisis. Her resignation comes just days after President Trump withdrew his pick to run the U.S. Immigration and Customs Enforcement (ICE) department, Ronald Vitiello, without giving Nielsen a heads up. Trump reportedly wanted a nominee that would steer ICE in a tougher direction, according to media reports.